Only 300 copies were printed. 22 Major Arcana Cards, inspired by the Great Circus of Life. There are stars and roustabouts, successes and failures, dreams and nightmares. 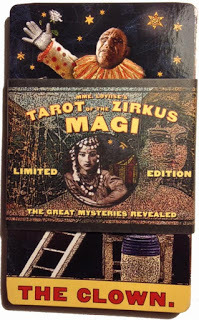 The clowns, acrobats, equestrian acts and entrepreneurs, each with their fond expectations or dashed hopes, all comfortably express the truths and secrets underlying the realm of the Tarot. The two worlds merge as seamlessly as if they were meant for one another. Far from being just an "art deck" or a "gimmick" deck, every effort has been made to create a genuine working deck aimed at practitioner and novice alike.